For the past twelve months I have been travelling around New Zealand and Australia and later in 2017 will head to USA and Mexico. 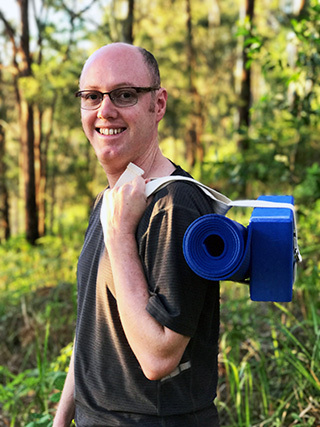 Prior to leaving Sydney, I was doing three yoga classes a week at The Yoga Nook in Dulwich Hill and loved every minute. I was very sad to be leaving and remember becoming quite emotional when saying goodbye. It was going to be a challenge to keep up regular classes due to my new nomadic life but something compelled me to seek out classes wherever I could and I must say, I have found the whole process very illuminating, adding a depth to my yoga that I didn’t see coming. Being a student of Iyengar Yoga, there is always a sense of familiarity in every studio you enter. You know the props (and usually what to do with them), are aware of the emphasis on alignment and can predict the cyclical nature of backbends, forward bends, pranayama etc. Teachers are always keen to hear who you have studied with. Invariably they know them directly or at least know of them, or at the very least their lineage. Whilst each studio and teacher does things slightly differently, the poses and sequences are familiar and whilst you may be thousands of miles from your home studio, there is a strange sense of being at home. Despite this familiarity, one thing I didn’t expect is how illuminating having a variety of teachers can be. Hearing a different teachers instructions, or having a posed described in a slightly different way can bring much to your practice. 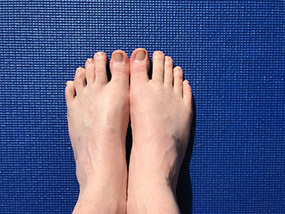 In Christchurch at Yogabase for example we focussed on ‘big toes’ and their relationship to the other toes in ensuring they are connected to the mat. Now, every time I stand in tadasana and look at my toes, I think of Christchurch! I refer to ‘lying over a brick’ as the Palmerston North pose as during the month I studied with Jyoteeka at Yoga on the Square, we focussed on opening the shoulders and often started a class with this pose. Your ears also get a good workout too as you naturally listen more intently as you attend classes with a new teacher. Teachers tend to use certain phrases consistently and have mini-sequences that they call upon over time. If you have been studying under the same teacher for a long time, you get to know these idiosyncrasies and there is nothing wrong with that. But when you attend a new studio for the first time and encounter a new teacher, your ears prick up and you hang on every word they say. This only helps to deepen your understanding and allow you to further access a pose. In a couple of cases, I actually finally understood what my teachers had been telling me for years. 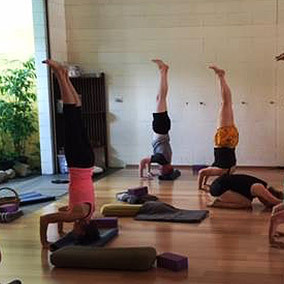 In Darwin, I was lucky enough to live close to Darwin Yoga Space and out of the 32 days I was there, I attended 28 classes – almost like a personal intensive. It was here that I achieved my first Sirsasana II and began exploring moving from Sirsasana II to Bakasana (something I am still working on by the way). Every time I lift out of my hips in an inversion, I remember fondly one of my Darwin teachers in particular, who assisted me in seeing what a difference it can make. I was also lucky enough to participate in a “Beginning a Home Practice” workshop which was a crucial step for me to begin and maintain a regular practice with a gypsy-style life. Tips and sequences have allowed me to continue to practise even when no Iyengar studio is nearby. The next challenge is to work towards becoming a yoga teacher and I am currently studying for my Introductory Assessment – not an easy feat considering I am rarely in one place for more than two months at a time. I have begun the process with my original studio back in Sydney and will fly in for workshops and weekend intensives when possible. Where will it all lead to? I really don’t know but am convinced that the value of yoga and the benefits it offers are a key motivator for me to pursue this goal. I look forward to the possibilities and would love to take a class with you one day either as a student or as your teacher at some stage in the future. Who knows where it may be in the world? This post in no way advocates ‘class hopping’ as having a consistent, regular teacher is very beneficial. However, the circumstances I found myself in meant I had an opportunity to explore something different. I encourage anyone who travels to explore the possibilities when away from home. You have been more successful than us at keeping up the discipline of doing the classes. When we started 2 years ago we vowed to both keep upr Pilates regime. Sadly that fell to the wayside although we did keep up with our exercise through walking, touring etc. Well done! Keeping up a regular practice is hard. I make sure I do 15 mins every day which started after I did a 15 for 30 challenge (15 minutes for 30 days) including posting to a Facebook group to keep me accountable. House sitting with dogs is always good to get a daily walk in. No matter where in the world I place my mat, I can hear the voice of Iyengar yoga teacher Elzbieta Jablonska saying, “spread your buttocks!” and “lift your sit bones”, among other things. I feel fortunate that her instructions play in my head no matter where I practice.